Cover photographs Front: Tillandsia albida, a six-year-old clump looking like Christmas candles. Back: T. stricta and others can be beautiful as single rosettes, but most increase in beauty as they grow as shown by this six-year-old group. 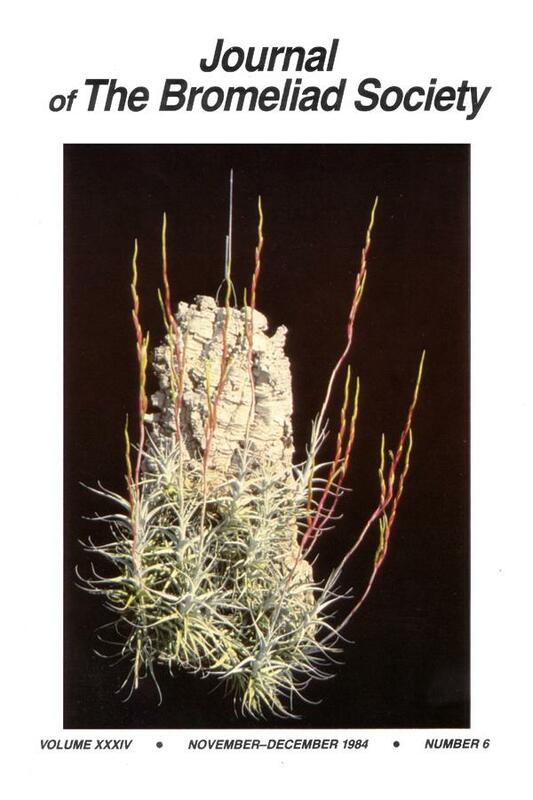 Photographs and text beginning on page 245 by Dr. Mark A. Dimmitt, curator of plants, The Arizona-Sonora Desert Museum, Tucson. ominations are now being accepted for the election of directors of the Bromeliad Society, Inc. for the term 1986-1988. The Society is divided into 10 geographical regions and each region elects its own director(s). Ballots for this election will be mailed with the May-June issue of the Journal. Nominations must be made in writing and be postmarked no later than 17 March 1985. Each nominee must be a member of the Bromeliad Society, Inc. Six nominations will be accepted for each position. The six earliest postmarks will determine the slate for each position. No director may serve more than two consecutive terms. PROCEDURE FOR NOMINATING: 1. Obtain the consent of the nominee. 2. Report the name of the nominee to the Nominations Committee chairman with the name of the region to be represented and a brief biography of the nominee. 3. Request that an acceptance form be sent to the nominee. The Nominations Committee and the Bromeliad Society, Inc. are seeking more than one nomination for each post. Please seek out and send these names in. We need more qualified directors so that our Society will GROW. 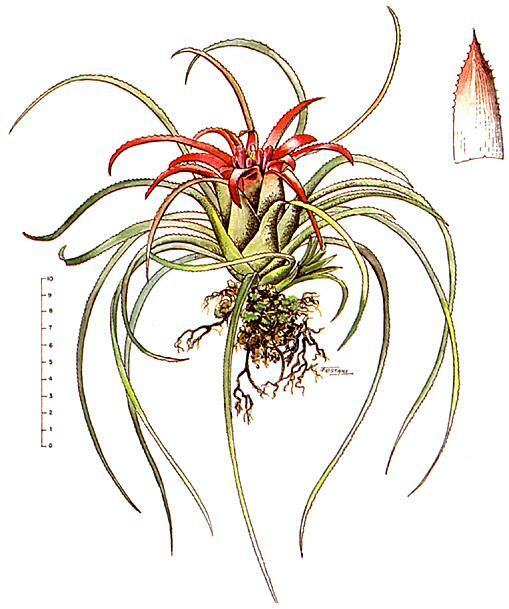 his species was described as a Bromelia by Beer in his work on the family in 1855 and so retained by Baker in 1889 although Regel had separated it from Bromelia as a Nidularium in volume 15 of the Gartenflora in 1866. The illustration featured above was made in time to be cited in Baker’s Handbook but never published. Lindman in 1890 was the first to recognize the genus in its present circumscription as Regelia but unfortunately the name had already been used. Mez in his monograph in 1896 also recognized the genus as Aregelia but typified it by a species of Nidularium. Finally in 1935 it was necessary to give it a clear title as Neoregelia and in 1978 it appeared as a Brazilian postage stamp on page 80 of the Journal. with 17 spikes, about 8 years old. The heavy clump is wired internally to hold it together. illandsias have been enjoying a rapidly growing popularity in recent years. I know this is happening in California, and I’m told that they’re catching on in the Southeast too. Nothing could please me more, since tillandsias have been one of my primary obsessions for more than a decade. Tillandsias have an undeserved reputation for being slow growing and often difficult to cultivate at all. I think this results from a failure to recognize their differences from other bromeliads. I want to share what I’ve learned about growing them rapidly. It is helpful first to compare the two major groups of bromeliads from an ecological/horticultural perspective. In this article the word tillandsia (uncapitalized and unitalicized) refers only to the xerophytic or atmospheric species of Tillandsia which grow in bright, semi-arid habitats. 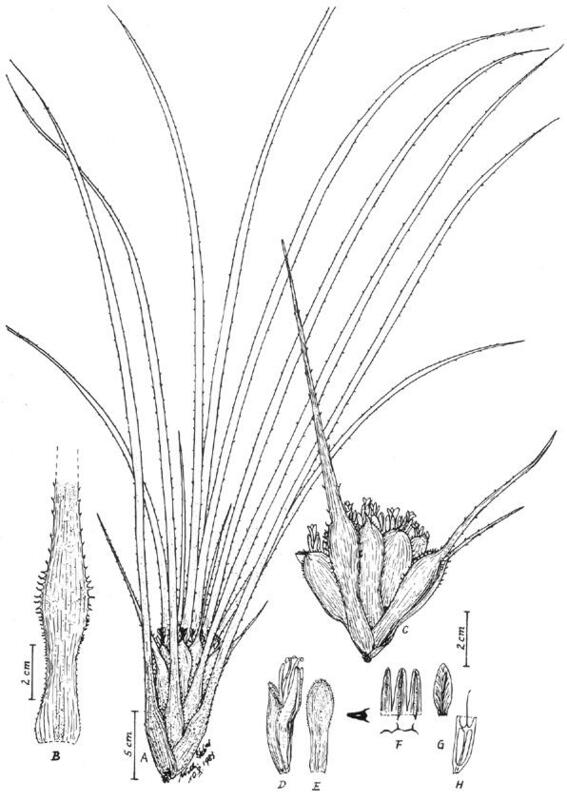 It also includes the xerophytic species of Vriesea such as V. espinosae and V. rauhii. The other main group is the tank bromeliads, those which hold water in the center of their rosettes. These are the aechmeas, vrieseas, neoregelias, guzmanias, etc. It includes mesophytic species such as T wagneriana and T. imperialis. There are of course intermediate forms such as T. hildae and T. mima that can hold a little water, but probably seldom do because of their and habitats. I consider most tank bromeliads rather difficult to grow into show quality specimens for several reasons. The problems stem mainly from two traits – their regular symmetry and their usually glabrous leaves. The shiny leaves render any damage highly visible, such as spotting from hard water. 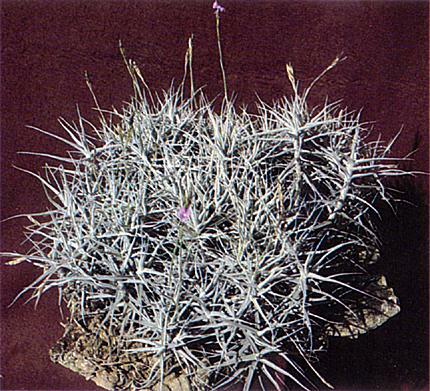 They are easily injured by adjacent spiny plants such as aechmeas, so they require ample spacing. The perfect symmetry of many tank bromeliads is a primary source of their beauty, but it renders any imperfection highly noticeable. A damaged leaf cannot be removed, for its absence would be obvious. If a plant is moved to a brighter or darker location, the new leaves will grow in a tighter or looser rosette, ruining the symmetry. Also, because of the symmetry most tank bromeliads are shown to best advantage as single rosettes. Since most have an annual growth cycle (a flowering plant produces pups which flower the following year), this means frequent dividing and repotting. People with a few plants don’t notice how much work this involves, but bromeliimaniacs with hundreds of plants know what I mean. Lastly, the extremely popular neoregelias require careful feeding, because giving them nitrogen near maturity inhibits the development of their color. On the plus side, tank bromeliads generally make better house plants than tillandsias. They tolerate low humidity, and many also do well in low light, especially vrieseas and guzmanias. They also grow better outdoors in the and Southwest. The tillandsias differ from the tank bromeliads in most of the above characteristics, and the differences make them easier to grow into near-perfect specimens. Water spotting is rarely visible because of the dense coating of trichomes. The leaves are generally tougher and less easily damaged; and damage is less noticeable in most species because of their informal shapes. Also because of their looser symmetry changes in light rarely ruin a plant’s beauty. Fertilizing does not affect color or form, only growth rate. Lastly, tillandsias require less care and space because they don’t need frequent dividing and repotting (most don’t need potting at all). Most species increase in beauty as they increase in size, thus can be left alone for many years. In addition, they can be grown fairly crowded, since they don’t injure one another. Unfortunately, there are some unfavorable comparisons with tank bromeliads. The tillandsias require high light and high humidity and air circulation for good growth, and thus are less adaptable as houseplants. Several species can maintain themselves in good appearance for many months in the home, so they are as suitable for temporary decorations as poinsettias, vrieseas, and other florist’s plants which are eventually discarded and replaced. However, I’m speaking to bromeliiphiles who I assume want their plants to grow. Of course some dedicated people grow them quite well in windows, but I would not recommend most tillandsias as beginner’s houseplants, nor would I expect to find show specimens grown in a typical home environment. Optimum growth requires a greenhouse or a mild outdoor climate. I find it puzzling that these plants which are adapted to the semiarid tropics would be less tolerant of aridity than the tank bromeliads, which come from wetter habitats. Even though tillandsias grow where they endure weeks or even months without rain, the humidity almost never goes below 50%. Still, tank bromeliads probably never experience low humidities either. I shall have to leave this mystery to a research biologist. I firmly believe that the reputation of tillandsias for being slow and/or difficult is caused by a failure to recognize their differences from other bromeliads. There is no trick to growing them. If they are given their three main requirements – light, humidity, and circulation, healthy plants are guaranteed. The growth rate is proportional to their nutrition: they respond to generous feeding. I fertilize every week with 20-20-20 plus micronutrients at one-half to one-fourth the recommended strength. Full strength doesn’t harm them, but I don’t think it does any more good. The accompanying photos show how fast some species can grow under these optimum conditions. Ages given are from a single mature rosette. FIG. 3: T. meridionalis at 6 years. It is slower growing than most, but will probably make a large clump in time. FIG. 4: T. paleacea, 8 years old. This species breaks up easily, so it does not hang well. The only significant problem I have had with this forcing program is that during dark or damp weather the plants may become covered with algae. If noticed early it is easily controlled with a copper bordeaux spray (without oil); the copper doesn’t harm even tiny seedlings. Recurrence can be prevented by cutting back on watering. If you delay treatment until the algae spreads, the plants will be marred because the clinging dead algae is as ugly as live algae. If you want to grow large clumps, it’s necessary to do it fast. The old, original stems which hold the clump together eventually decay, and the clump falls apart. Of course there is an upper limit — if you water and feed so heavily that the center of the clump stays wet, decay is accelerated. There is also natural variation in this trait within and between species (more about this in a future article). In the noncaulescent species most of the growth occurs in the first three to five years, starting with a single mature plant. 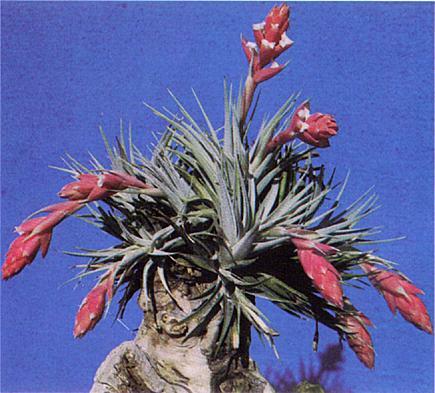 A healthy tillandsia after flowering typically produces three to five pups which flower the next year and also multiply three- to five-fold. (If only your savings account did the same!) As the clump becomes crowded, the number of pups decreases to one or two, and some of these get smothered by adjacent growth. Tillandsia caput-medusae, for example, reaches its maximum size in six or seven years under optimum conditions. After that the clump becomes denser as more and ever smaller plants crowd the center of the clump, but the clump diameter doesn’t increase. I have a 15-year-old clump which is now strangling itself and breaking apart. Caulescent species such as T. duratii (fig. 2) and T. aeranthos don’t ever slow down because the pups remain well spaced and do not compete. These species enlarge until the center rots or they break apart under their own weight. It’s difficult to provide specific details on cultural conditions because they vary among species and with the grower’s climate. Light is the trickiest to quantify. Give them as much light as they can take without burning; one must learn the limits from experience. In the U.S. outside the arid Southwest about 50% of full sun is good. On the immediate coast and in very humid areas many species enjoy full sun. The higher the humidity, the more light and heat they can withstand. Beware of the exceptions such as T. butzii which requires rather shady conditions. Humidity should be maintained above 50%. Few tillandsias will grow well if it is chronically less than this, especially at high temperatures. Air circulation should be provided by fans kept on 24 hours a day. At the minimum the circulation plus humidity should be such that when the plants are watered in the morning, they are dry by mid-afternoon. I have enough fans in my greenhouse to create a breeze that keeps leaf tips in constant motion. I did not mention temperature among the major requirements because it is rather irrelevant. While cloud forest species such as T. macdougallii cannot tolerate temperatures above 90° F (32° C), most tillandsias can take 100° or more if the humidity is also high. The same species grow well at daytime temperatures in the 60°s. Night temperatures are even less important, except that most species cannot tolerate frost. I am growing tillandsias in a heated greenhouse at 55° F minimum and in an unheated one with winter lows in the 30°s; there is no noticeable difference in growth rates in the two houses. Presumably a 20 to 30 degree day-night differential is desirable, since tillandsias are CAM* plants. Some of the Argentine tillandsias are another exception to the indifference to temperature. Tillandsia aeranthos and T. duratii rarely bloom in my heated greenhouse; they apparently require a cool winter to trigger flowering. The first three of the following tables summarize my observations and opinions respecting the suitability of various species for being grown as clumps or as single specimens, and their appearance when blooming. The fourth table lists species recommended for cloudy climates. Table 1 – Species which make large specimen clumps quickly. Table 2 – Slower growing, but also make large clumps. Table 3 – Best grown as single plants or small clumps of 3-5.
than most other species, and are recommended for cloudy climates. wenty degrees Fahrenheit on Christmas morning 1983 could hardly be considered a matter of cheer to bromeliad growers. Many in central Florida were dealt a devastating blow with two successive nights of that abnormally low temperature. Some bromeliads just were not tough at all, but many of the vrieseas proved their mettle. I became an unwilling expert overnight. For weeks we had been relocating the nursery and had not had enough time to prepare all of the stock for cold weather. The general arrangement of our nursery last December was that many of the plants were being grown in the open on benches grouped under a canopy of laurel and live oaks, which provided some protection from the wind. In other respects the plants were completely exposed to the weather. Some valuable lessons are to be learned from this unpleasant experience and I want to report these expensive observations for you to think about. While the southern hemisphere is moving toward the spring of the year, the northern hemisphere is inevitably going to get colder before it gets hotter again. While appearing to be delicate, many Brazilian vrieseas showed that they can tolerate sudden drops in temperature far below the expected range. It is fairly obvious then that some vrieseas will tolerate a relatively cool greenhouse (in areas where winter shelter is required) and a thermostat setting of 40-45° F might be perfectly adequate. In warmer areas, vrieseas can be used for landscaping along with aechmeas, dyckias, neoregelias, and nidulariums. They will contribute much to the beauty of a bromeliad garden and deserve wider use. Some vrieseas put through the extreme stress of cold survived with a surprising defiance of their situation. I shall list them first. × ‘Belgische auslese’ was heavily damaged. erythrodactylon had serious losses. (There are evidently clonal differences in this plant since it occurs over a wide range and some growers report it as being hardy). fenestralis. In a group of approximately 30 plants, a few were lost outright, but the remainder survived, some with leaf damage, some unhurt. fosteriana ‘Red chestnut’ exhibited the same problems as V. fenestralis. hieroglyphica. A single plant in the ground had some leaves damaged, but the center and base remain intact. 'Nova’ had no test because I had sheltered them in a heated greenhouse. ospinae had 80% loss, the balance showed minor leaf damage. saundersii suffered severe damage with almost half of the group killed outright and the balance had serious leaf damage. chrysostachys was wiped out to the plant. malzinei yellow and red-bracted forms and var disticha suffered 25% loss and the surviving plants had leaf damage. splendens × glutinosa had a 30% survival rate. splendens × incurvata survived with little damage, apparently inheriting its hardiness from the incurvata side of the family. Are There Symphylids In Your Potting Mixes? here do not appear to be any references to symphylids as an insect pest of cultivated bromeliads although they have been reported causing serious damage to pineapples, Ananas comosus ‘Smooth Cayenne’, in Hawaii and Queensland. This may be caused by a lack of information about these insects and their detrimental effect on plant growth. Symphylids are small, white centipede-like insects which inhabit soils. 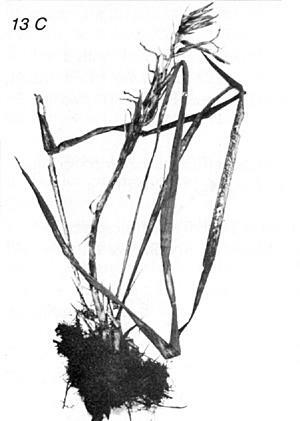 Many feed on decaying organic matter, but some are known to feed on plant roots. Symphylids, which have caused losses in Queensland pineapple fields, are of the genus Hanseniella. This is a large symphylid (to 6mm) with 14 body segments and 12 pairs of legs. It is white in colour, often with a grey or brown streak on the back. It has prominent, active antennae. It is shy of sunlight and moves quickly under cover to avoid exposure. Symphylids have no eyes and move by feel as though undecided as to direction; a trait which is quite characteristic. These insects cannot burrow and are found in loose, open, or stony soils. Symphylids affect plant growth by eating the tips of new root system growth, restricting the uptake of water and nutrients. 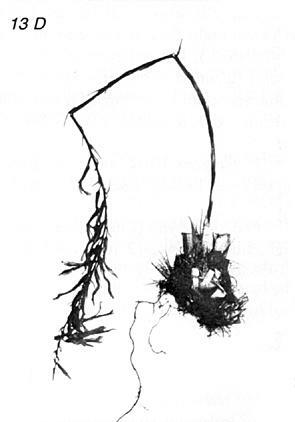 This damage results in a root system with short, heavy branching in a characteristic ‘witches broom’ appearance. If you find a plant with this type of root development then check the soil or potting mixture. Spread the mixture thinly on a dark background and look for small white centipede-like insects. Plants most at risk are those planted in soil or garden beds in open or stony soils. Plants grown in mixtures of sterile or inert ingredients such as peatmoss, perlite, washed sand, etc. should not be at risk, but infestation by migration from infested soil is a possibility. Control is by sterilization of the potting mix, or by drenching the soil or mixture with Lindane (400 ppm active). Avoid putting this solution on the leaves as tissue burn is likely to occur. Drenching with Lindane provides good residual protection against reinfestation. ow quickly something which took months of planning and hours of construction and work can be swept away. But the learning, the fellowship, the bromeliads, and the memories will endure. It takes dedicated dreamers and idea makers and workers to put on a world conference, and dreaming and inspiring and problem solving had to come months before specific plans could be turned into reality. Chairman Paul Isley and Co-Chairman and Council President Stan Oleson were both highly visible going from one affiliate meeting to another. First, Paul gave slide programs explaining what a world conference was all about; then Stan visited each society several times over to explain all details and to encourage members to participate. Finally, dreams became reality as the affiliate, commercial, and individual growers labored mightily early in the week to make all ready for the Bromelympics. By Thursday evening the judges and show officials had done their work and it was time for Pomp and Inflorescence: the Opening Ceremonies. For the evening Grand Opening, both plants and people were all dressed up, but only the plants had been judged. Beribboned or not, they were all beautiful under the chandeliers and showed to advantage as camera flashes and Grecian melodies filled the hall. No mistaking it, this was a party. And it had its own celebrities and stars—human and plant. At the forefront among the bromeliads were the often ignored xerophytic terrestrials, the hechtias, dyckias, and abromeitiellas, in their glory this time around right along with their more airborne relatives, in particular, the tillandsias, as should be expected in this, tillandsia country. To open the party and the games, we had the toga’d gods Mark Brown and Shelley Kramer, carrying the torch for the bromeliads (no self-respecting bromeliad is going to run about in a toga although many could be seen holding aloft blazing torches of their own). The participants included beautiful and ambitious displays constructed by several commercial nurseries, by five California BSI-affiliated societies, and the Bromeliad Society of Houston, which moved plants, materials, and people more than 1500 miles for the opportunity. The main event, however, consisted of the 507 bromeliad contestants entered by 73 individual members, many of who went home winners. But the biggest winners of all were those who truly looked, listened, learned, and enjoyed. On Friday, Saturday, and Sunday, bus tours took conference-goers on the garden tours. From the giant plantings at Huntington Gardens to the commercial gardens of nurserymen, to the small backyard gardens of the average LA home, bromeliads were showing off – out in the open and under fiberglass. They were growing with companions as diverse as ferns, cycads and succulents, turtles and bees; growing up trees, over and about rocks, and down in earth. Friday night was auction night. Under the auctioneering magic of Floridians Bill Frazel and Herb Hill, Jr. a willing audience of bromelophiles enthusiastically purchased sixty donated, rare bromeliads and wonderful drawings, thus turning bromeliads to gold. In more prosaic language this auction resulted in the record-breaking gift of $6,000 to the Mulford B. Foster Bromeliad Identification Center in Sarasota, Florida. An Aechmea orlandiana ‘Snowflake’ whipped up $60 worth of enthusiasm while a variegated Tillandsia ionantha generated $325 of unmitigated lust. That was topped, however, by a Neoregelia ‘Pinwheel’ and a variegated Neoregelia ‘Fosperior’, both of which saw a frenzy of bidding with winning bids of $450 each. The learning never stopped at the convention whether touring, or gazing admiringly at show entrants, or attending seminars. The lectures were chock full of information and beautiful slides—pleasures for the mind and the eyes. Alas, the earnest lecture-goer needed a third day to do the speaker circuit right. This event proved to be the most difficult to attend in its entirety; there was so very much to absorb. The lectures were global in scope, but limited by time. The competition provided by all of these simultaneous events and also by the lure of thousands of plants in the sales room required both careful timing and superior stamina. Money also helped. On Saturday night came the Closing Ceremony Extravaganza. It began with a banquet exceptional for the quality of the food and the speedy and cheerful service. The awards ceremony with Paul and Stan in togas was memorable with its winners, medals, and applause. It seemed to be the absolutely peak performance. Then, Jack Grubb, chairman of the 1986 World Conference lead the cheer: “Let’s do it again, ‘One Mo’ Time!’.” That will be May 21-26, 1986 in New Orleans. See you all there. compare notes at the Conference. FIG. 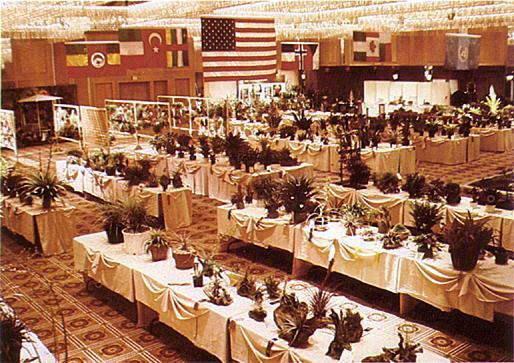 6: Displays and competition plants at the Los Angeles Airport Hilton grand ballroom. FIG. 7: Aechmea recurvata var ortgiesii (Baker) Reitz. Reproduction of plate 22, Bromeliaceae and the Endemic Bromeliad Malaria. Dr. Reitz, honorary trustee of the Society for a quarter of a century, director of the Herbário Barbosa Rodrigues and the Parque Botanico de Morro Bau, and editor of the botanical review Sellowia, has published this monograph in the Flora Ilustrada Catarinense series, of which he is also the editor. This work consists of a complete survey of the bromeliads of Santa Catarina, in southern Brazil, covering more than 95,000 square kilometers. The author states that before this work there were about 30 native species known in this area and that through his research of the past thirty years that number has been increased to 100 species, 33 varieties, and 4 forms. Dr. Reitz emphasizes the connection between the bromeliad populations and the high incidence of malaria-transmitting mosquitoes (Anopheles subsp. Kerteszia) demonstrating how these insects grow in pools of rainwater collected in the foliar rosette thus perpetuating this endemic disease. The extensive discussion of this subject includes the geographical distribution of bromeliads and their morphology. It also presents ecological and climatic aspects of this family. Dr. Reitz credits Dr. Lyman B. Smith, with whom he has been closely associated, with the earlier studies of the bromeliad-malaria association. Taxonomic descriptions of bromeliads occupy more than 400 pages of this book. Although written in Portuguese (there are summaries in English and German) the use of that language should not present an obstacle to readers familiar with plant terminology. The presentation begins with basic keys and continues with subfamilies, starting with the Pitcairnioideae, and concluding with a thorough bibliography and index. The third part of the book consists of a collection of remarkably detailed botanical drawings from live specimens by Domingos Fossari. These illustrations (fig. 7) are in a class apart because of the use of color. Most of the reproduction is technically superb. This work is recommended to bromeliad researchers and to research and academic librarians as an intensive and interdisciplinary study. Librarians of bromeliad societies might also consider buying this book as entirely within the scope of knowledge and interest of their members, and specifically as an aid to the educational programs of their organizations. uring a plant-hunting trip in January 1983 to the State of Bahia, in the region of Ilhéus-Una, a new, uncommon bromeliad species was found. The specimens taken for analysis to the eminent Brazilian specialists Prof. Edmundo Pereira and No de Azevedo Penna were described under the name Neoregelia longisepala (fig. 8) and published in the Boletim do Herbarium Bradeanum – Bradea, vol. IV, no. 1, October 18, 1983. This region is marked by the presence of a great quantity and diversity of bromeliad species. It is situated in the south of the State of Bahia near the Atlantic coast and consists of low lands, generally flat or with small hills. Its vegetation belongs to the Atlantic forest type with trees which often are 30 meters tall. A great number of epiphytes are distributed in several levels of vegetation inside this forest, with a prevalence of bromeliad species. 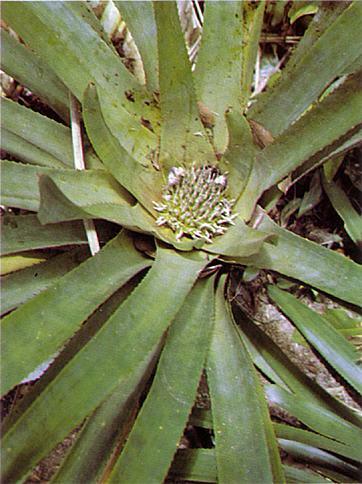 Bromeliads such as cryptanthus, nidulariums, and aechmeas can also be found growing on the forest floor. This region offers an immense source for botanical studies—so far not satisfactorily carried on. During occasional short searches in that area, new species as well as some of the lesser known have been found growing in one of their last natural refuges. Among the latter we can point out Aechmea mollis L. B. Smith, Ronnbergia brasiliensis Pereira & Penna, and Vriesea recurvata Gaudchaud (which will be referred to in a separate report). Neoregelia longisepala Pereira & Penna. Plant epiphytic. Leaves many, in a very dense rosette forming a funnel-shaped water reservoir at the base, ligulate, rigid, green; leaf sheaths elliptic, 30 cm long, 10 cm wide, covered by brown scales on both sides; leaf blades about 85 cm long, sublinear, 5 cm wide, attenuate near the apex, tipped with a pungent spine, inconspicuous lepidote on the upper side, densely white lepidote underneath, subdensely serrate, with dark-purple, 4 mm-long spines. Scape 5 cm long, 2 cm in diameter; scape bracts narrowly ovate, long-acuminate, 6 cm long, en-tire, cream. Inflorescence compound, many-flowered, subcapitate, 13 cm in diameter, 9 cm long, sunk in the center of the rosette; primary bracts narrowly ovate, long-acuminate, 6 cm long, entire, thin, cream, strongly nervate, brown lepidote toward the apex; branches corymbose, about 10-flowered; peduncle thick, much surpassed by the bracts, the outer ones 2 cm long, the inner ones 1 cm long; floral bracts lanceolate, long-acuminate, with a spineform apex, 55 cm long, entire, greenish, thin, strongly nervate, ecarinate, brown lepidote toward the apex, becoming equal in the middle of the sepal or slightly longer. Flowers 8 cm long, inconspicuous pedicels (4 mm long); sepals narrowly lanceolate, long-acuminate with a spineform tip 50 mm long, 6-7 mm wide, asymmetrical, greenish, ecarinate, connate for 10 mm, brown lanate toward the apex; petals long-spatulate, apiculate, 60 cm long, connate for 15 mm, violet; stamens 50 mm long, adnate to the petals for 15-20 mm; anthers lanceolate, mucronate, 14 mm long; epigynous tube 4 mm long; ovary subovate, 20 mm long, white; placentae subapical; ovules apiculate. Type: Brazil, State of Bahia, County of Una, road BA-001. Leg. Elton M.C. Leme no. 445, A. M. de Carvalho, L. A. Silva, J. Kent & R. Frasier, 8 January 1983. This exquisite neoregelia does not adjust itself either by the subgenera Hylaeaicum or in the subgenera Neoregelia. However, it presents common features of both as shown by its indistinct pedicels and short, connate petals. All of its other characteristics appear to be peculiar to this species. We can, on the other hand, affirm that this new species is more closely related to Amazon region plants than to the species found near the Atlantic coast. The N. rosea L. B. Smith from the Peruvian Amazon region is the closest relative to N. longisepala. It is mandatory to stress here that the habitat of the N. longisepala, considering its geo-climatic aspects and evident influences on the vegetation, is very similar to some areas of the Amazon region. Undoubtedly, the south of Bahia – the last shelter of animals like the golden-headed lion tamarin (Leontopithecus chrysomelas) and plants like the N. longisepala – deserves to be more deeply studied. All the research work, however, must be done without delay before the man-made destruction of the natural vegetation is achieved. he genus Fascicularia Mez. 1891, with only five known species is endemic to Chile. It is mostly terrestrial and found in the coastal region. We seldom see living plants in botanical gardens or private collections although the blooming plants with bright red rosette centers are very decorative. This genus will tolerate lower temperatures than its more tropical relatives. Overnight temperatures below freezing cause scarcely any damage if the plants are dry cultivated in the cool period. The characteristics of the genus are: Plant stemless, terrestrial or rarely growing on tree trunks. Leaves rosulate, usually rigid, linear to narrowly triangulate, margins serrate. Inflorescence simple, densely capitate, sunk in the center of the rosette. Flowers sessil or short-pedicellate. Sepals free, carinate, tomentose lepidote; petals free, apex obtuse, blue, texture relatively subcoriaceous, at base on the inner side with two small ligula; stamens included. Filaments free, anthers linear, subdorsifixed; pollen globose. Ovary inferior, ovules few, central to subapical loculated, epigynous tube large and conspicuous, fruit dry, seeds globose, unappendaged. The type of the genus is Fascicularia bicolor (Ruiz & Pavon) Mez. 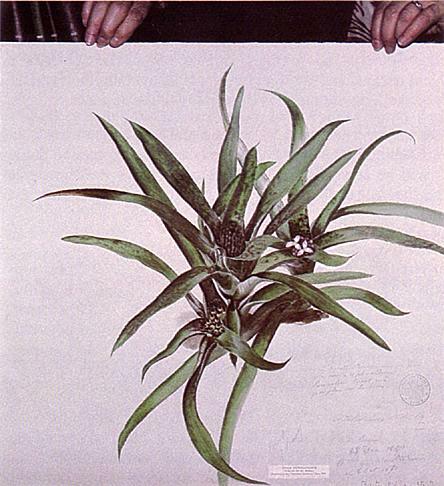 1896, first described by Ruiz and Pavon as Bromelia bicolor in Flora peruv. et chil. 3:33.1802. 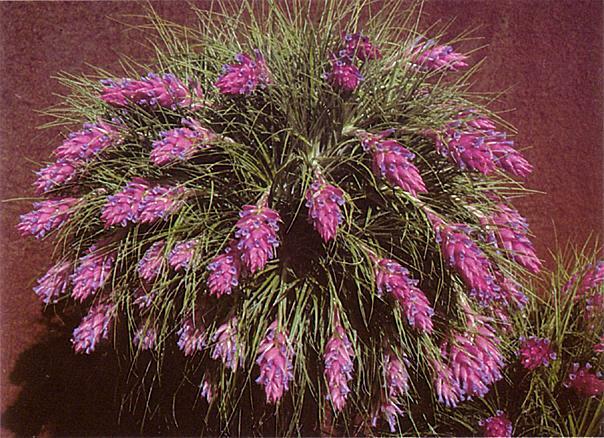 Before Mez established the genus Fascicularia, the generic affiliation was frequently confused by botanists and plants were described as Bromelia, Billbergia, Hechtia, or Rhodostachys. Fig. 11A, Habit – illustrating only the inner leaves with the inflorescence. Complete plants have many more leaves forming dense rosettes of about 1 m in diameter. Fig. 11B, Sheaths – showing the interesting shape of the sheaths of the inner leaves. The margins are biconvex embaymented and the higher parts of the sheaths again becoming wider. They are very densely senate. With the transition in the long, tapering, linear-triangular blades the spines of the margins become smaller and more distantly arranged. Fig. 11C, Inflorescence – showing its involucrate outer bracts and gradually reduced blades. A scape in the true sense is missing or severely shortened so we can also call the extreme inner leaves, or outer bracts, scape bracts. Fig. 11D, 11E. Flower bracts – are more stiff in texture and join about the middle of the sepals (fig. F). The anterior sepal is ecarinate, but the posterior ones are very strongly alate-carinate and these wings are continued to the ovary (vide cross-section on the left). Fig. 11G. Petals – are relatively small and of stiff texture. Fig. 11H. Ovary – with the large epigynous tube is more than half as long as the complete flower. FIG. 11: Fascicularia bicolor (Ruiz & Pavon) Mez, with detailed flower analysis. illandsia pretiosa (fig. 9) is a beautiful plant, very rare in cultivation, and known only from Ecuador in the valley of Mindo and the Pichincha region. We collected this plant in July 1983 in the Mindo Valley in a mist-forest at an altitude of 1700 m.
T. pretiosa belongs to the group of T. lindenii (fig. 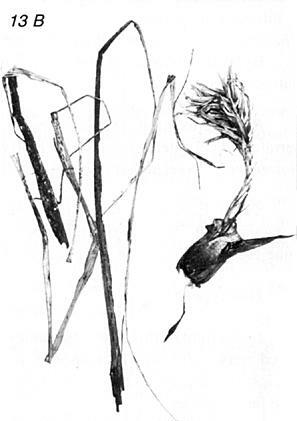 10), T. umbellata (please see Journal 31(5): 200-202; 1981), T. anceps, and T. cyanea. The main difference between T. lindenii, T. umbellata, and T. pretiosa is, according to L. B. Smith, the surface structure of the floral bracts. In the first two these are prominently nerved, in T. pretiosa even more so. All three species possess simple, complanate, sword-shaped inflorescences with deep blue petal-blades with a white eye at the base. While the ensiform inflorescences are arranged in a single plane and are dense in T. lindenii and T. umbellata, they are lax in T. pretiosa after flowering. Plant stemless, flowering up to 50 cm high. Leaves densely rosulate. Sheaths distinct, broad ovate, concolorous with the blades; these are linear-triangular, long attenuate, 2 cm wide, nearly glabrous. Scape erect, shorter than the leaves; scape bracts densely imbricate, the lower ones subfoliate, the upper ones with a reduced blade, abruptly acute. Inflorescence simple, long ovate-acute, strongly complanate, up to 20 cm long and 11 cm wide, ± 18-flowered. Floral bracts spreading at and after anthesis, scarcely concealing or covering the pale violet rhachis, up to 55 mm long, exceeding the sepals, carinate, even, glabrous, pale violet. Flowers spreading up to suberect. Sepals free, long-elliptical, acuminate, 4.5 cm long, the posterior ones carinate, pale violet to white. Petals up to 8 cm long, with large, spreading, somewhat rolled-back, bright blue blades with a white eye at the base. Style and stamens deeply included. Collection number: Rauh 60212, July 83.
blue color of the petal blades. T. pretiosa, but with differences in the surface structure of the floral bracts. he editor of the Journal asked me if I had any slides showing bromeliads in flower arrangements. I replied that I was sure I could find some and from now on whenever I make an arrangement using bromeliads I shall ask the photographer at the Honolulu Academy of Arts to take a slide of it. I would like to make it clear that in garden circles the term flower arrangement covers all sorts of arrangements of plant material both live and dried, with or without actual flowers. In Hawaii, my type of work is often called flower sculpture because of its three-dimensional aspect. Most of these arrangements are on a large scale because of the size of the museum building. One can always take an idea and scale it down to look well in the space it is to occupy. The picture (fig. 12) shows one of a pair of arrangements used at the front entrance of the Honolulu Academy of Arts earlier this year. I’ll try to explain step by step how I did this arrangement. Aechmea caudata as the highlight. First, one needs a large container, in this case it was a copper dish and a large kenzan (needle holder). A 15- to 16-inch section of flowering banana, Musa rosacea, (or one could use the stem of one of the heliconia plants) was pounded firmly into the center of the kenzan and together placed in the center of the container. An inch of water was added so that any stems that needed water would have it right away. The first item put in the container established the height of the arrangement and had the right relationship to the width of the container. In this case, the copper dish was 16 inches in diameter. Next, the dry, twiggy branch of the tiny white poinsettia, Euphorbia leucocephala, about 30 inches tall, was pinned to the back of the banana stem. Then the large, dry leaves of Pentagonia macrophylla were pinned to the front of the banana stem, their size and dark color giving strength to the arrangement. For color, the beautiful ‘Peter Buck’ ti leaves, Cordyline, were placed in front of the Pentagonia. In front of these salmon and pink leaves I placed silver-grey Cecropia peltata leaves looking like sheer lace because the Japanese rose beetles had been doing their work. For the brightest point in the arrangement I used five inflorescences of Aechmea caudata and finished the arrangement with a few folded ‘Peter Buck’ ti leaves. A few rocks were added to the base and the container was filled with water. The pair of arrangements lasted well for a whole week. ecent collections by Dr. C. H. Dodson of the Marie Selby Botanical Gardens staff at several sites of intensive floral investigation (florula) in western Ecuador have provided me with a number of novelties of the Bromeliaceae including this first instance of natural hybridization in the subfamily Pitcairnioideae. Four specimens from the Province of Cotopaxi seem certain to represent members of a hybrid swarm involving two sympatric, ornithophilous lithophytes, Pitcairnia heterophylla (fig. 13A), and P. pungens (fig. 13D). Pitcairnia heterophylla (Lindley) Beer is a common species ranging widely from central Mexico to Venezuela and Peru. The densely flowered inflorescence is nearly sessile. Flower color varies from white (forma albiflora Standley & Smith) to pink and red. In western Ecuador, the pink-flowered phase is most abundant. While usually found growing on rocks, many plants also occur as epiphytes. Their altitude range varies from 50 to nearly 2300 m, but where P. heterophylla grows near P. pungens it seems to favor elevations below 1500 m.
Pitcairnia pungens Humboldt, Bonpland & Kunth has a much more restricted distribution, having been found from Colombia to central Peru. The much exserted, racemose inflorescence is in marked contrast to P. heterophylla. Flower color varies from yellow-orange to dark red. The recorded altitude range varies from 800 to 3500 m; the majority of the specimens I have examined were collected above 1700 m.
In the steep valley of the Rio Pilalo at Tenefuerte, an area of rich premontane forest, these two species are growing apparently within the foraging range of a shared hummingbird pollinator. Most of the specimens seen from this site fall somewhere outside the accepted range of variation, appearing to be part of a hybrid swarm. The nearly vertical rocky roadside and cliff face seem to provide the conditions required by the hybrid plants. 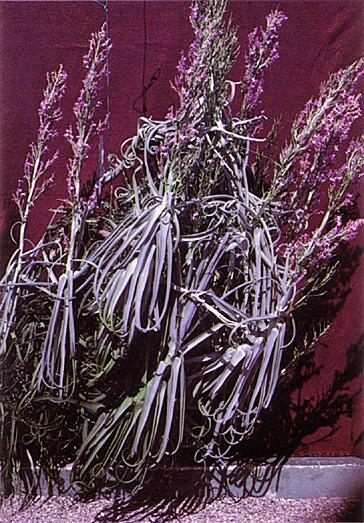 Individuals suspected to be of hybrid origin produce abbreviated scapes with variable flower color. Also present are superficially pure plants of P. pungens and P. heterophylla. The percentage of pollen viability has not been tested, but several specimens of the purported hybrids show developing capsules. I suspect that hummingbirds service the hybrids as well as the parent species. FIG. 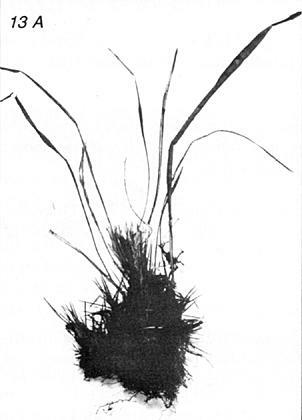 13 A: Pitcairnia heterophylla. FIG. 13 B: P. × daiseyana. FIG. 13 C: P × daiseyana (Type) FIG. 13 D: P. pungens. Photos by The Marie Selby Botanical Gardens. Hybrida naturalis e P. heterophyllae (Lindl.) Beer et P. pungente HBK inter parentes media. Plants clustering, stemless; leaves linear, entire and deciduous or reduced, serrate and persistent; scape erect, 8-40 cm high. Inflorescence densely racemose; flowers erect to secund-spreading; corolla zygomorphic, red to pink. In the light of this new information, I suggest that P. pavonii Mez be investigated very carefully. That species is distinguished by its much broader leaf blades, but appears to be similar in its shape and size of inflorescence to the hybrid just described. 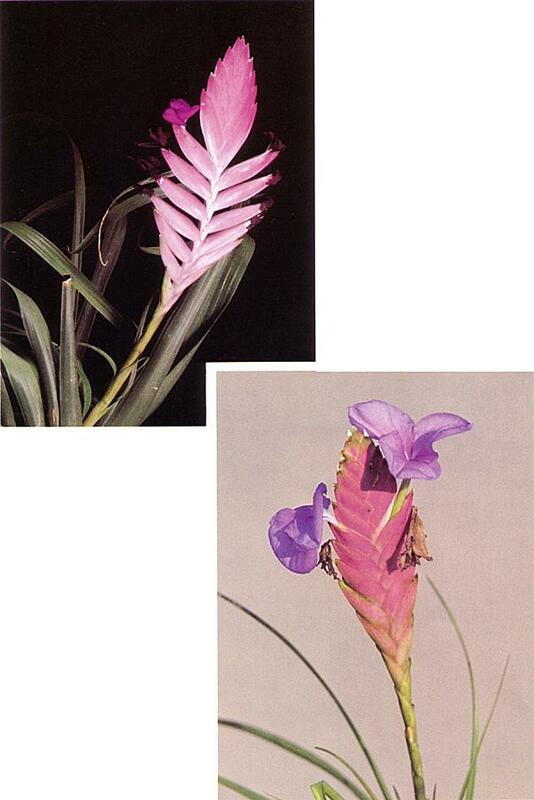 Additional materials examined from the Tenefuerte florula site include the following: Pitcairnia × daiseyana Luther: same locality as above, inflorescence to 18 cm high, flowers salmon pink, 19 July 1982, C.H. Dodson & A. Embree 13 400 (SEL); inflorescence to 48 cm high, flowers bright pink with a yellow throat, 12 June 1983, C.H. Dodson, D. Benzing, & D. Bermudez 13930 (SEL); inflorescence to 14 cm high, flowers salmon red, 12 June 1983, C.H. Dodson, D. Benzing, & D. Bermudez 13931 (SEL). P. pungens HBK: same locality as above, inflorescence to 55 cm high, flowers red, 19 July 1982, C.H. Dodson & A. Embree 13401 (SEL). P. heterophylla (Lindl.) Beer: same locality as above, inflorescence to 6 cm high, flowers pink, 12 June 1983, C.H. Dodson, D. Benzing, & D. Bermudez 13953 (SEL). bout 14 years ago, while we still had our nursery in Sydney, a man came looking for a bromeliad capable of flowering at the time of the annual Royal Easter Show. I had one billbergia that flowered at that time of the year and was able to find a flowered plant of Billbergia 'Chas Webb'* with five offsets attached. I advised my customer to cut the parent away leaving the offsets on the old root stock and to repot the clump into a larger pot. He asked me to show him how and I demonstrated with the help of a serrated knife. As he left, I offered him the parent plant saying that it would produce more offsets, but he said to keep it to make up for the time I had spent helping him. I took the old plant out into the garden and stood it upright at the base of an azalea and promptly forgot it. The following year, with the Easter Show and the judging of the plants in the Horticultural Pavilion, I got a most excited phone call from same man. He had won not only Grand Champion in the bromeliad section but Grand Champion Potted Plant of the whole show. All five attached tubes of that B. 'Chas Webb' had flowered at one time – a very fitting memorial to Mr. Webb who was one of the early members of The Bromeliad Society. I suddenly remembered the old mother plant in the azalea bed. There it was with several offsets and another inflorescence. I lifted it from the garden to make sure, but it was no mistake, the scape came from the old vase. This was the first time I could say for sure that a plant flowered for the second time. The second such happening was with B. ‘Fantasia’. Most of my plants were cut back for our move from Sydney to Queensland, but noticing signs of flowering low down in the tube, I left one B. ‘Fantasia’ in its pot untouched. It duly re-warded us with flowers and later an offset. When the flower stem had dried off I gave it a twist and pulled it out. Since the parent kept its fresh appearance the mother and daughter looked like identical twins. Twelve months later I happened to look into daughter which was still attached to the mother plant, and remarked that it was going to flower. Shortly afterwards, my husband took the pot down for a better look and called out that both plants were going to flower. They both had perfect inflorescences. In both cases, I remembered that I had removed the old flower spikes soon after their petals had shriveled. Did this trigger the second flowering? Both plants were hybrids. Was there something in their makeup to cause this happening? I have since had a third plant, Aechmea caudata var. variegata flower with a normal central inflorescence for a second time. A fourth, Nidularium procerum, flowered normally the first year, but the following year produced one bract and a tiny bunch of flowers from four of the bottom leaves. I found the flowers when removing leaves to get at three offsets higher up the stem. After putting those offsets aside for stock, I removed the old flower spike, dried off the base of the plant, and then placed it upright in an eight-inch pot half filled with mix. It produced two offsets this time and while removing them I noticed another spike starting. After the second flowering, there were three more offsets. I again removed the old flower spike. It is now winter, over three years since the first flowering and three more offsets will be ready for removal in the spring. The plant is still a lovely twelve-leaved rosette with no leaf tip die back. I wonder – might it flower three times? here been several interesting and beautifully photographed slide shows produced of the various bromeliad species, but to date no one has made extensive use of modern video technology to show off the truly photogenic qualities of these plants. At least one of the slide shows is set to music, and Sherman Gar-dens of Newport Beach, California, did a brief segment of videotape on bromeliads a few years ago. In May, 1984, the Saddleback Valley Bromeliad Society finished the first broadcast quality videotape about bromeliads. Seventeen minutes long, it is narrated with a musical background. Professionally filmed and edited, the new videotape is entitled The World of Bromeliads. It gives a broad view of the major genera: what they are, where they come from, how they are grown. The filming began more than a year ago at the Southern California Bromeliad Council Show held at the Los Angeles County Arboretum. For the next several months, the film crew ranged across Los Angeles, Orange, and San Diego counties capturing on tape picture studies of the various places where the plants are grown, as well as portraits of some of the people who grow them. Individual and commercial growers alike cooperated in making the tape. As a result, there are segments on growing bromeliads from seed and on the more complex process of meristem culture. The views of private gardens show some of the creative ways in which bromeliads can be used in the yard. Overall, the purpose of the tape is to introduce the novice to bromeliad culture, but the photography is designed to interest the veteran grower as well. The Saddleback Valley Bromeliad Society intended this to be a pilot project, a demonstration of some of the possibilities of video as a medium for illustrating the best qualities of the plants. At a later date others might be interested in zeroing-in on some more specific aspect of bromeliad culture. For example, separate tapes on growing from seed, meristeming, or filming a collecting trip in the wild might be interesting. Videotaping has several advantages. It is easier to see the plants in context with camera pans and zooms. 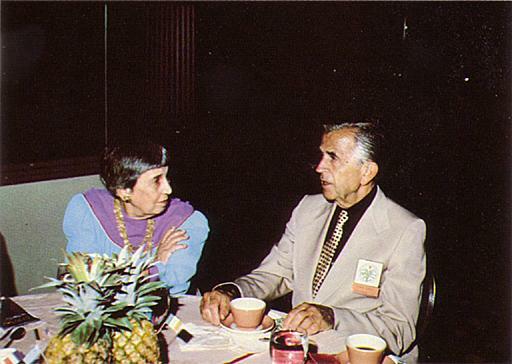 Interviews with growers – especially those who are world famous – would allow permanent records of them and their ideas. Editing procedures produce a finished product which is highly condensed; many more plants can be presented in a very short space of time. There is also the possibility of air time on commercial, public, or cable TV to gain large audiences. The chief disadvantage of professional quality videotape is its cost: approximately one thousand dollars per finished, edited minute. And it is necessary to have a written script before the shooting starts. This latter point became evident to the Saddleback Valley crew members when they had to sit down and cull less than one-half hour of finished tape from more than three hours of random, rough shots. It was really painful to give up some really interesting footage. Saddleback also discovered that it was possible to trim costs by plying the crew with plants. One unsuspecting camera operator is now thoroughly hooked as a bromeliad enthusiast. The timing of the release of the tape proved fortuitous. Clips of the videotape were used by the World Bromeliad Show Committee to advertise the 1984 Bromelympics in Los Angeles. The possibilities of bromeliads on videotape are limited only by the imagination. Education, archive recording, and publicity are only some of the reasons why videotaping promises to be a useful medium for promoting bromeliads. Tillandsia stricta Solander, 1813, grows under a variety of conditions in both dry and wet areas in Trinidad, Venezuela, Guyana, Surinam, Brazil, and Argentina from sea level to an altitude of 3,500 feet. This is a variable plant; leaf texture, coloration, and size differ according to habitat. The [individual plants are] made up of thin, recurving, leathery leaves, 3 to 6 inches long, covered with silvery scales. The slender, short scape is erect or recurved. The dense, simple, multifarious spike, 1 to 2 inches long, has yellowish white to rose bracts. The flowers have blue or violet petals that turn red as they mature. Victoria Padilla, Bromeliads (New York: Crown, 1973), 97. November 9-11 Caloosahatchee Bromeliad Society 2nd Annual Show, Lee County Garden Council & Activities Center, Ft. Myers, FL. Terry Virta (813) 455-3090.